BLOOMINGTON, Ind. (AP) — Indiana coach Archie Miller searched desperately for answers in the second half Tuesday night. Eventually, Juwan Morgan came through. Again. He scored 23 points, grabbed 10 rebounds, had four assists and made play after play in a closing flurry that helped the Hoosiers finally fend off Texas-Arlington 78-64. It sure wasn’t easy, as Miller had warned before tip-off, and there was plenty of angst inside Assembly Hall as the Mavericks (3-2) methodically trimmed a 20-point second-half deficit to one with 6:33 left to play. The senior forward who asserted himself as the team’s unquestioned leader last season spurred the decisive 17-4 run with four points, four rebounds, two assists and one steal in the final 6:13 — as seven teammates sat out with injuries. And it wasn’t just the numbers that impressed Miller. Morgan repeatedly set ball screens, took charge in the huddles and implored his teammates to keep playing hard. But Morgan made it work and got just enough help from his teammates. Romeo Langford finished with 16 points and eight rebounds before leaving with a bloody nose with 4:25 left. He did not return for the Hoosiers (4-1), who have won four straight home games. Smith added 13 points and five rebounds and Rob Phinisee scored eight points and had four assists on a night he played more than 38½ minutes. Edric Dennis scored 13 of his 19 points in the second half to lead Texas-Arlington. Brian Warren added 14 points in the return to his home state. Those two each made three 3s to put Texas-Arlington in position for a potential upset. After Indiana extended its 17-point halftime lead to 48-28 with 18:09 to go, Dennis and Warren finally warmed up. Three consecutive 3s cut the deficit to 12 and when Radshad Davis made another 3 with 11:49 to play, the Mavericks were within 55-47. Warren made 1 of 2 free throws with 7:54 left and Dennis followed that with a layup to get Texas-Arlington within 61-60 before Morgan took the cue and closed it out. “We didn’t make the couple of plays you have to make to win on the road against a very good Big Ten team,” coach Chris Ogden said. Texas-Arlington: The Mavericks have shown promise during this early-season stretch and used a gritty second-half performance to challenge Indiana on its home court. Foul trouble, mistakes and a lack of depth eventually took its toll. 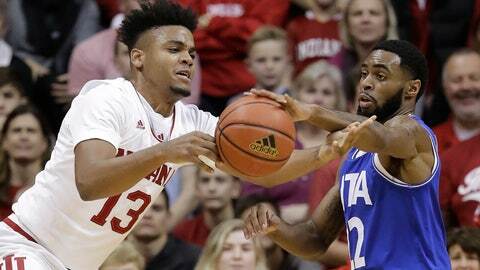 Indiana: With seven players unable to finish the game, the Hoosiers managed to survive. Sure, the mistakes could have done them in. But they made just enough plays down the stretch with the crowd behind them. Texas-Arlington: Davis had 12 points and David Azore finished with 10. … Jabari Narcis had seven points and seven rebounds. … The Mavericks finished 8 of 29 on 3s after going 1 of 12 in the first half and committed 18 turnovers. Indiana: Morgan also had three blocks and two steals. … The Hoosiers were 2 of 12 on 3s, 16 of 23 from the free-throw line and matched their season-high with 18 turnovers after committing 13 in the first half. Miller didn’t have a prognosis on either Langford or sophomore guard Aljami Durham, who didn’t play in the second half after hurting his back when he was fouled early in the first half. Five players — Zach McRoberts (back), Devonte Green (bruised thigh), Jerome Hunter (lower leg), De’Ron Davis (sore Achilles) and Race Thompson (concussion-like symptoms) — all missed the game. Texas-Arlington: Heads to Arkansas on Friday. Indiana: Will host California-Davis on Friday.